With cold weather upon us, what can we do to help out our feathered friends? Birds maintain a temperature of 106 degrees, in order to keep warm they must eat high fat, high energy food all day long. In the fall, food was plentiful with all the available fruits, berries, nuts and seed heads from flowers and trees. From January until food sources replenish in Summer there is quite the need to feed, provide houses for shelter and provide water. Provide high fat seed choices: Black-oil sunflower, sunflower kernals and peanuts are some higher fat seeds and nuts to offer for winter feeding. 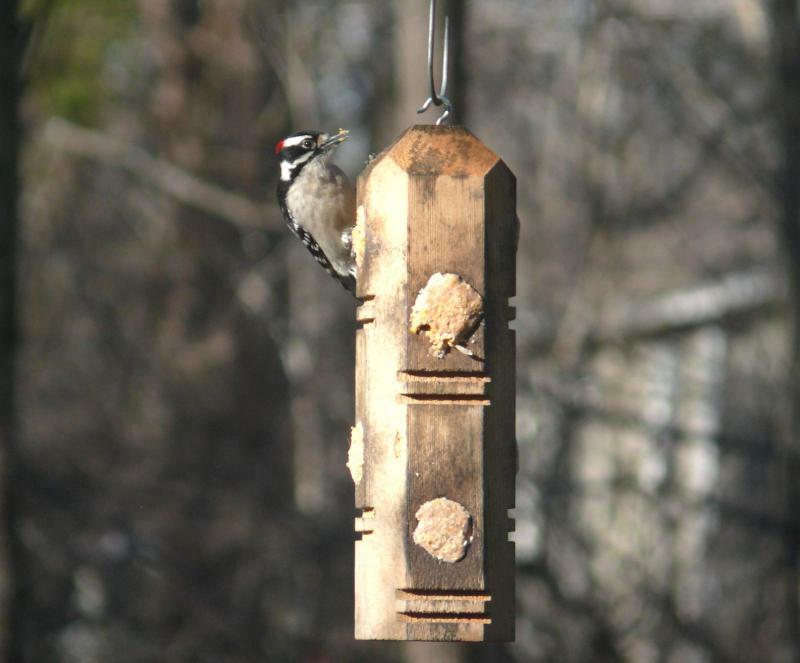 Peanuts and sunflower kernals offer no mess under the feeder and no harmful husks that can be toxic to some plants( azaleas and rhododendrons are very sensitive). If you use Black-oil Sunflower seed keep feeders out of flower and shrub beds...another plus to the shelled sunflower . . . Eastern Bluebirds are able to eat them, since their beaks are not able to crack open most other seeds. Provide suet: Suet comes in all flavors, shapes and sizes to appeal to almost every type of bird. It is high in fat and protein and easy to digest giving them a quick source of energy. There are squirrel-proof suet feeders as well as hot pepper suet to ward off squirrels and raccoons. Provide water: Keeping water avaliable and ice free is a must in winter. 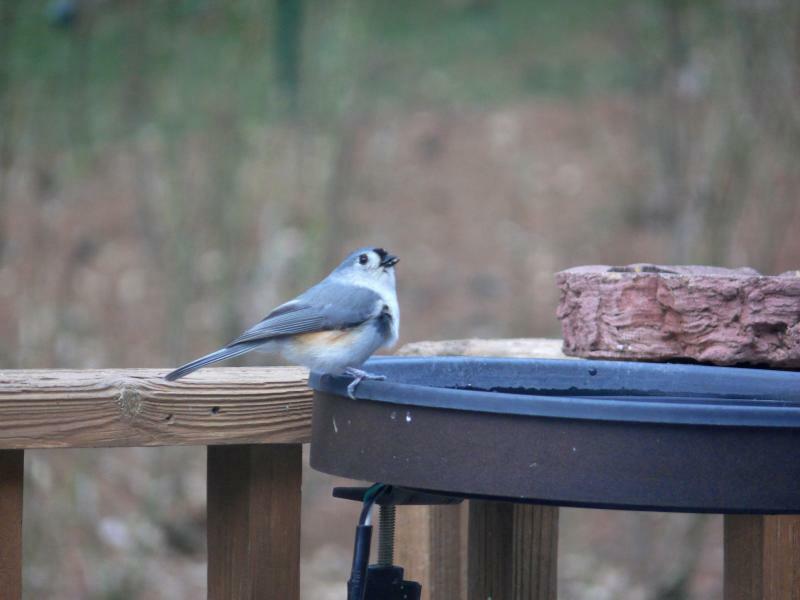 This can be done with the help of heated bird baths or de-icers for your existing bird bath. Birds not only need water for drinking when all is frozen but they need to bathe to keep feathers clean and in top condition to ward off the cold. Many birds will come for water and never touch your seed or suet. Provide nest boxes: Make sure nest boxes are up and cleaned out from summer. Birds use them in winter to escape the cold wind and to conserve energy as they gather 4-5 in one box allowing their body heat to build up in the box. I have seen 5 bluebirds in one of my boxes, chickadees in another and a downy woodpecker staying in still another box. Winter is also the BEST time to install a new box for nesting next summer. Provide shelter: Not all birds will use boxes to stay warm, provide shelter with hedges and evergreens. Wax-myrtles, arborvitaes, pines, spruces, rhododendrons, ligustrums and junipers are all good choices. Even using your cut christmas tree out in the yard will provide cover and if you decorate it with edibles it will feed both birds and wildlife. Provide berry producing trees and shrubs: Many birds will not come to your feeders but will give you hours of enjoyment if you have planned your plantings. Trees and shrubs that provide fruit, nuts and berries in winter are most important. Hollies, Cleveland pears, crabapples, junipers, wax-myrtles and ligustrums are just a few of the many choices. I have had cedar waxwings, robins, bluebirds, and yellow bellied sapsuckers amusing me for weeks eating the fruit from my Cleveland pear tree. When that food source is gone they will move to my holly berries. Provide clean feeders and water sources: With many birds feeding in the same small space, there is always the chance of spreading germs and diseases from bird to bird. Moisture will cause seed to clump and mold. Moldy seed will make birds sick. Keep your feeders clean and old wet seed discarded to keep your feeding station a healthy one for your feathered friends. Don't forget to keep your bird bath clean with a fresh supply of water.